Following the end of World War II, one of the tasks taken on by influential New Jersey leaders was to redo the state's century-old constitution enacted in 1844. Governor Edge's attempt to gain approval of a new constitution had failed of ratification in 1944, but his successor Alfred Driscoll, a fellow Republican, renewed the effort, notably aided by the support of the prominent lawyer, legal educator and politician Arthur Vanderbilt. 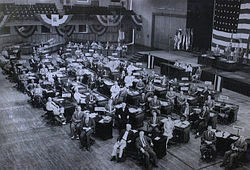 After weeks of meetings at Rutgers in the summer of 1947, delegates to a constitutional convention drafted a new document which consolidated the maze of state agencies and commissions; restructured the judiciary under a seven-member supreme court headed by a chief justice; and, perhaps most importantly, significantly strengthened the role of the governor. The chief executive's position was bolstered by allowing two successive four-year terms rather than the single three-year term of the prior charter and strengthening the governor's veto, appointment and fiscal management powers. The constitution subsequently approved by referendum of the voters established a system which most analysts described as making the New Jersey governor one of the most powerful of any state. But most New Jerseyans were more interested in restarting lives interrupted by the war, particularly in fostering the "baby boom" spurred by the return of soldiers coming home to reunite with or begin new families. To meet the demand created by larger households, residential builders looked to the suburbs, with much of the development aligned on newly constructed or expanded highways. Towns also rapidly built new or expanded existing schools, and investors backed commercial and retail projects to provide jobs and shopping closer to the new housing. In 1949, returning to a model from the past, Governor Driscoll proposed a toll-financed roadway crossing the state funded by the sale of privately backed revenue bonds. The project soon named the New Jersey Turnpike was a 118-mile route between the Delaware Memorial Bridge and New York City by way of a link to the George Washington Bridge. Built in only 21 months at a cost of $220 million, the road opened to traffic in November, 1951. Other toll highways followed the Turnpike precedent. The road later to be named the Garden State Parkway, which had an 18-mile northern section completed in 1950 financed by the state, was converted to a toll-funded highway built by a new highway authority, commencing construction in 1952 and opening sections to traffic in stages during 1954. Still another authority was created to finance with toll revenues the construction of the Atlantic City Expressway connecting Camden with Atlantic City, a road built between 1962 and 1965. "The Turnpike has permitted New Jersey to emerge from behind the billboards, the hot dog stands and the junkyards. 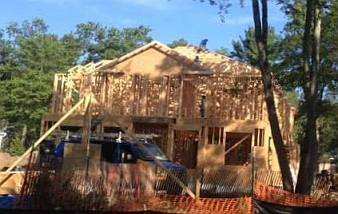 Motorists can now see the beauty of the real New Jersey." Governor Alfred Driscoll at ribbon cutting ceremony opening Turnpike to traffic on November 30, 1951, quoted in Jon Blackwell, "1949: Highway of Dreams,"
In addition to the new state highways, the federal government under President Dwight Eisenhower also approved in 1956 legislation creating the interstate highway system. Over the next 25 years, the federal program would support the building of interstates 78, 80, 95, 195, 280, 287 and 295, along with shorter feeder roads. The construction of the federal highway network was generally supported, but conflicts arose over the specific routes to be followed, particularly when protests were raised over the loss of special environmental resources. Interstate 95 was never completed along its entire route--the largest gap in the highway from Maine to Florida--as a result of local opposition in affluent towns and concerns over the loss of toll revenue by the New Jersey Turnpike. More broadly, other critics also pointed to the new highways as contributing to the ongoing loss of people and investment from the older cities to the suburbs. From 1950 to 1970, New Jersey's population growth surged, with the two decennial gains each exceeding 1.1 million persons--the largest in the history of the state. Most of the growth was in suburban communities, with older cities losing population, a trend exacerbated by the urban riots and disorders which broke out in cities like Newark, Plainfield and Asbury Park in 1967. Decline of the state's industrial base also undermined the economy as sunbelt states and foreign nations successfully competed to offer lower prices for real estate, workforces largely not unionized and willing to accept lower pay, weaker regulatory policies and lower taxes. Energy prices also spiked in 1973 as a result of the Arab oil embargo, providing further advantages to warmer climates seeking relocation of industrial and commercial development. The nature of the new suburban development also was more diverse and less tied to older cities. Jobs, shopping and other services traditionally based in central cities increasingly were available in suburban office complexes and shopping centers. Controversial state policies to redirect resources to declining cities, such as the income tax enacted in 1976 to increase state aid to urban school districts, had only limited success in slowing the long-term trends. In the mid-1970s, the state's unemployment rate and other economic benchmarks hit levels not seen since the Great Depression.